We’d love your help. Let us know what’s wrong with this preview of Postcard From Paris by Holly Willow. To ask other readers questions about Postcard From Paris, please sign up. This is a lovely romantic novel from author Holly Willow. The book is set in Boston, Massachusetts and Paris, France. It tells the tale of thirty-five-years-old Poppy who thought she was happy and that her life was settled. She was happily engaged to Daniel and enjoying her job. Then in the blink of an eye, everything changed. Not quite sure what was going to happen next in her life Poppy flies to Paris, France after seeing a postcard from there from an aunt she never knew existed. This is Poppy’s story of what happens when she is in the capital of Love. The book was exceptionally well written with good use of language, the sentence “fascination of a virologist peeking at a new strain of Ebola through a microscope” is an example of the authors varied use of words and phrases. The theme was interesting with plenty of twists throughout. I loved the characters, especially Selma who was clearly defined as larger than life and had a good, generous, heart. I found the story moved along at a nice pace and was very easy to read and the plot unfolded with some unusual and intriguing ideas. The outcome was a little bit predictable but in no way did it detract me from enjoying this book. I was excited to read this because it looked like a Hallmark type book. Meaning it has a HEA and so much drama/fun inbetween. This is not a YA book but it would be an adorable read for anyone who enjoys a good sweet read. Finding out her fiance is having an affair leads Poppy to find a postcard, book a trip to Paris, and accidentally get a job. Her new boss becomes her love interest and so many complications ensue. I really liked how the author portrayed each character. They have so many depths t I was excited to read this because it looked like a Hallmark type book. Meaning it has a HEA and so much drama/fun inbetween. This is not a YA book but it would be an adorable read for anyone who enjoys a good sweet read. Finding out her fiance is having an affair leads Poppy to find a postcard, book a trip to Paris, and accidentally get a job. Her new boss becomes her love interest and so many complications ensue. I really liked how the author portrayed each character. They have so many depths that you can see how much thought went into every single one. 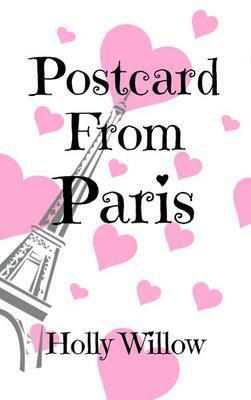 Postcard From Paris by Holly Willow is a story that pulled me in right away. We follow Poppy, a confessed workaholic, who is blindsided at her job and also in her personal life. Her fiance, Daniel, has to postpone their upcoming nuptials because he must travel for his work. Poppy and Daniel have agreed that careers come first, so even though Poppy’s job is now up in the air, she still has to support Daniel going to Hong Kong for six months. Until … she finds evidence of an affair. Turning to her Postcard From Paris by Holly Willow is a story that pulled me in right away. We follow Poppy, a confessed workaholic, who is blindsided at her job and also in her personal life. Her fiance, Daniel, has to postpone their upcoming nuptials because he must travel for his work. Poppy and Daniel have agreed that careers come first, so even though Poppy’s job is now up in the air, she still has to support Daniel going to Hong Kong for six months. Until … she finds evidence of an affair. Turning to her family for support, she instead finds a hidden postcard from an aunt in Paris she never knew she had, and decides it’s time. It’s time to get away from the confines and schedules of her every day life and do something daring … so she books a flight to Paris. While there, she meets a man who accidentally becomes her boss, makes new friends, and discovers a hidden family secret. She also starts to fall for her boss and has a new complication arise with Daniel and his possible affair. Trying to discover herself and what she needs to be happy turns out to be a lot more than Poppy was expecting to find in Paris, and I was rooting her on the entire way. This was a really well-written book that I liked from chapter one, really bringing readers into the story and giving us a likeable character to cheer for. There is a lot happening between the pages but it never felt like too much, and the pacing was spot on. If you are a chick lit fan I would recommend to grab this one for your winter reading list! This author (Holly Willow) has a strong no-nonsense descriptive style that I personally love. I feel as though she spent a great deal of time considering the characters, their lives, history, and personal ups and downs. Their relationships and complicated family situations are both interesting and relaetable. One of my favorite characters is Poppy's love interest. Such a complex man! I don't want to say too much and spoil the story for people who haven't read it... but I will admit I fell in lov This author (Holly Willow) has a strong no-nonsense descriptive style that I personally love. I feel as though she spent a great deal of time considering the characters, their lives, history, and personal ups and downs. Their relationships and complicated family situations are both interesting and relaetable. Holly Willow has an insatiable wanderlust and an active imagination. When she isn’t traveling, she writes stories that are set in places she has been to or would like to visit one day. She hopes you will enjoy reading her novels as much as she enjoyed writing them.